HÀ NỘI — The national beach football team gathered yesterday in Đà Nẵng City in preparation for their Asian Beach Games next month in Việt Nam. Coach Trương Công Tuấn called 19 players – three goalkeepers, nine defenders and seven strikers – for 18 days of intensive training. Most players are from Đà Nẵng and Khánh Hòa who are the national defending champions and runner-up clubs, respectively. They will then take part in a competition in Ordos City, China, from August 20-28. The event will see seven other teams who will play in a knock-out stage. Four winners will advance to the semi-finals. Iran, Japan, Oman, Lebanon, Thailand, Bahrain and host China will compete. 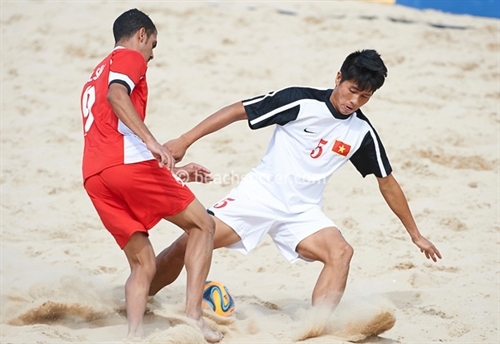 The national beach football team gathered yesterday in Đà Nẵng City in preparation for their Asian Beach Games next month Việt Nam.